Both veterans and new users of Catalog-on-Demand will find plenty of useful material in our new user manuals. We like the term "knowledge books". 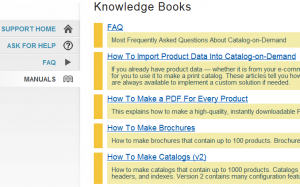 It reminds our users that looking through the articles is a great way to learn about everything having to do with making effective print catalogs. Our goal is to aim higher than ordinary "how-to" articles. Each topic will include information about why the feature is included. The more you know about the "why" of features, the better you will get the "how". Once you know the purpose of a Catalog-on-Demand feature, the steps for using it are usually very simple.